It is not just Hafiz Saeed’s jihadist ambitions that we willfully ignore. Take the case of the Foreign Office, which has become a global laughing stock after repeated attempts to hoodwink a world that has long since opened its eyes. Declaring Pakistan as a state sponsor of terrorism was bad enough, but one mistake can be considered a blunder. Following this by pretending that there are no militants in Pakistan, however, ruined any credibility the FO had left. Does the Foreign Office really expect anyone to take seriously their protest against a new report by the American military that says Pakistan is home to terrorist sanctuaries and proxy forces used against Afghanistan and India? The same day, FO termed Kashmiri jihadis as ‘freedom fighters’, and it was only recently that Punjabi Taliban in Pakistan declared a renewed focus on Afghan jihad. These may be dismissed as out of the state’s control except what does that say about the state if it has no control over jihadis carrying out attacks from within its borders? The world is not blind to the role of darlings like Hafiz Saeed, but also politicians like Sheikh Rasheed and high-ranking officers in the military and intelligence agencies. Years after General Hamid Gul’s retirement, a politician is said to have asked him, “General sahib aap asl mein kab retire hon gey?” (When will you actually retire?) One does wonder when exactly this jihadist general will hang up his boots. In fact, another ex-ISI chief, General Ahmad Shuja Pasha, seems to be following in General Gul’s footsteps. The antics and utterances of these retired generals, including berating the civilian leaders and labelling them traitors, do however provide an extremely useful insight into how disastrously delusional the mindset of at least some of the retired brass is. After all, these fine men do not go cuckoo suddenly after retirement. It is inconceivable that another former ISI chief, General Javed Nasir, would have abruptly joined the Islamist evangelist Tablighi Jamaat right after leaving service. Officers like the late Colonel Ameer Sultan Tarar, aka Colonel Imam, became indoctrinated on the job. Ironically, Tarar was assassinated by the TTP whose antecedents he had helped sire. Scores of Islamised officers, including generals, and the rank and file does actually seem to believe both that India is out to dismember Pakistan and that they and their jihadist proxies — with divine help — are the bulwark against this impending disaster. Contrary to the popular belief that General Ziaul Haq started the Islamisation of the services and society, this delusional thinking has been the formal cornerstone of the Pakistani security establishment’s both inward and outward view at least since General Ayub Khan’s era. We can continue to pretend that black is white, day is night, and wear our blindfold tightly to prevent us from having to see what is right before our eyes, but closing ones eyes does not change reality. We can protest our innocence until the end of time, but until we take off our blindfold and face the difficult reality, it will be ourselves who continue to suffer the consequences. This entry was posted in Blogs and tagged extremism, Foreign Office, Hafiz Saeed, Hamid Gul, jihadis, Tasnim Aslam by Mahmood Adeel. Bookmark the permalink. Excellent article. You have nailed the BIG LIE, and exposed the extremist establishment, which basically is made up of all the crooks in the pic,plus some more in the background. It’s time for people like you to mobilise public opinion and the civil society to wake up to the dangers of this Jehadi mindset which is nothing but a Suicidal, it will devour and destroy Pakistan. Soon, ISIS will take all the militant outfits of Pakistan under its umbrella and flood them with Oil money which they have plenty. 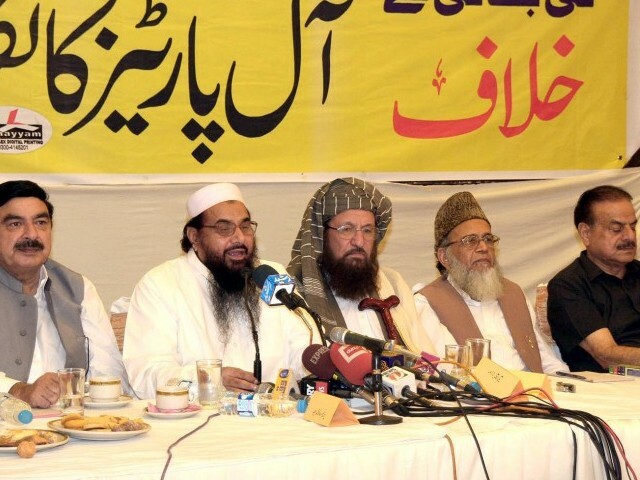 In return, all these Jehadi elements will lead them to Pakistan’s Nuclear assets. The World will not allow Nukes to fall into the hands of ISIS and Pakistan will become the battleground and suffer massive collateral damage. Hope wiser elements prevail and stop this scene from unfolding which now seems inevitable. A nice article. I do endorse it on major contents. But do have a point to make. Ayub Khan was the one who had proposed a Joint Defense proposal to Jawaharlal Nehru in 1962 (if my memory doesn’t fail me) when there was a border conflict that India faced from China. When Jawaharlal Nehru retorted, Joint defense against whom; Ayub Khan responded, against traditional common enemy from North (I believe he meant China). It indicates that Ayub Khan till then was not basically anti- India.